'Housepower' was the catchy tag given to a 1959 industry campaign to promote all things electric in the home, from light bulbs to heating and cooling technologies. 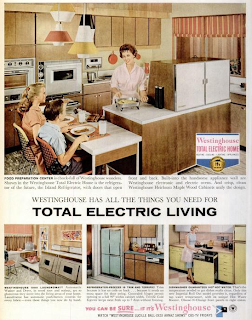 Naturally, the appliance-rich kitchen was very much the focus of this effort, and manufacturers vied for the public's attention in predictably wacky ways. Above, we have Westinghouse's effort. That big box on top of the island is—ta da!—the Refrigerator of the Future. It had doors both front and back, so you could access your snacks and ingredients with total convenience. It's a concept that I think is worth pursuing today, albeit in less conspicuous installations. To wit: How about a through-the-wall fridge that opens onto adjoining rooms?